Wilf was found straying in mid December and weighed only 4lb.4oz. He was anaemic, had conjunctivitis and a large wound on his side. After a few weeks in CP care he is healthy and looking forward to his forever home. He is a beautiful, friendly, black cat with an impressively long tail. Although he has not been used to human contact, he is now sociable and interactive and can be very talkative! He eats well, loves a run around the house and the company of other people. A ladies’ man, he is also willing to hang out with the lads. Fully house-trained, he would make an excellent addition to any catless household. 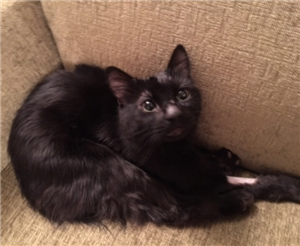 He is around 6-8months old and, although his straying days are over, would still like some outside space when he is ready.